Sacrifice Isaac: here's a ram instead. This isn't a novel issue. You mention “line upon line” as a principle. Latter Day Saints often quote this without knowing the origin. I read the scripture with a different context than I normally hear it [partially] quoted. The writing around that verse (context) is condemning the beliefs and practices of the “Drunkards of Ephraim.” I read the verse as condemning the pattern of revelation (line upon line) that those people were using. I’m certainly the LAST person you want to trust regarding interpretation of scripture. But, I urge you to take a look if you haven’t already and decide for yourself whether Isaiah believes their pattern of receiving revelation is how God wants to give us revelation. The idea is that we are not worthy to have the fullness all at once. We get only line upon line to the church as a whole precisely for the reasons Isaiah gives. Likewise as Matt 13 notes parables are given so that "Hearing you will hear and shall not understand, And seeing you will see and not perceive;"
God could reveal lots of things to the Church as a whole that he doesn't because of the receptiveness of the Church. However it doesn't mean he doesn't reveal things. I'm quite confident the brethren know things about certain topics well beyond what is taught to the church as a whole. 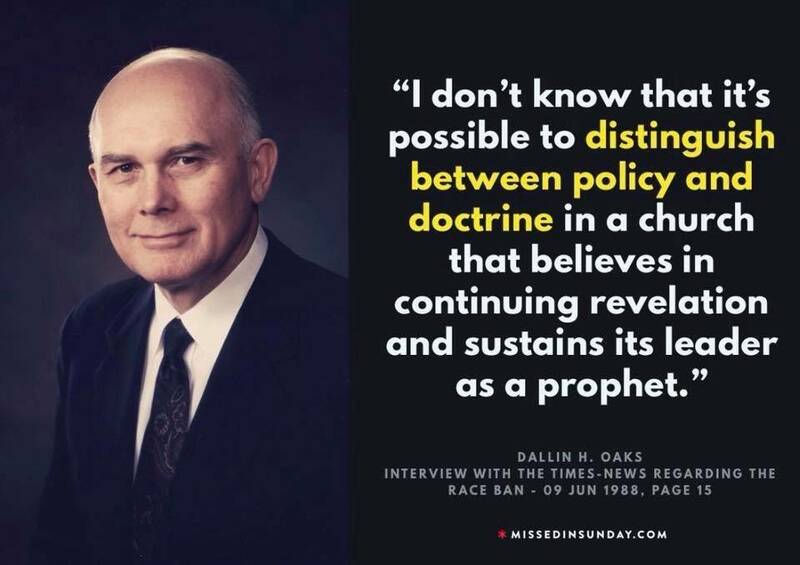 It might help to define what doctrine is. I'll just leave you all with that can of worms! How are you so confident of this? The evidence (what scripture quotes Christ saying in the New Testament if you want to limit to what he is quoted as saying as a mortal) isn't simple and is more than just the two great commandments. I have no problem if people believe those two teachings are the only ones we should be paying attention to in the scriptures, but implying that was all he said involves ignoring a lot of stuff, imo. Not the same issue at all. Isaac and the ram was directly symbolic of the Savior's atonement and therefore represents an eternal unchanging doctrine as opposed to a change. What if we get back to God and he tells us we should have just kept it simple like Christ did? Love each other and afterwards come back to His love and forever be with those we love? I do think about that and just wonder sometimes. See, I don't think on it, because I don't believe for a second that that's what Christ did. I think this Disneyfied version of Christ is one of the biggest problems in the world today. This is a reason why the bible is questionable. Abraham should have been prosecuted for attempted murder in a perfect world. In any event, this story sounds mythical, as being unnecessary. Surely God could teach his questionable blood sacrifice for sin requirement without actually going to this extreme. I think sometimes it’s just two humans with different opinions. That’s all. Maybe God is indifferent about using the words Mormon or Mormons? I agree. When you look back over the history of the church and all the things that were practiced that have been changed or disavowed, I have a hard time thinking that god is that schizophrenic. I don't believe that god gives a "revelation" then totally does a 180 three years later. A much more believable explanation to me (and apparently many, many others) is that this is all coming from men. Men in charge that exercise their authority and make their decisions. Agreed. What evidence is there of this at all. None. Can you justify that belief? What are God's eternal truths? Does He outline them for us anywhere? I want to hear your arguments and evidences that support that idea. Not so I can debate with you but so I can understand why you believe it and not just that you believe. So you are an absolutist (as far as the blog uses the word), correct? (I don't want to assume anything). I see my view as balanced (I know most people here disagree). I 100% believe in continuing revelation. I believe in it completely. Joseph Smith taught that " This is the principle on which the government of heaven is conducted—by revelation adapted to the circumstances in which the children of the kingdom are placed. Whatever God requires is right, no matter what it is, although we may not see the reason thereof till long after the events transpire." I even agree with Brigham - "I felt like a thousand lions. I took the books and laid them down one by one beginning with the Bible, and said, "there lies the Bible, there the Book of Mormon, and the Book of Doctrine and Covenants, the revelations God has given through Joseph for the salvation of the people in the 19th Century, yet I would not give the ashes of a rye straw for these three books so far as they are efficacious for the salvation of any man, that lives without the living oracles of God." But circumstance specific revelation and prophetic guidance are a far cry from following a gospel where anything and everything is temporary and subject to change at any time. That kind of gospel I believe goes completely against scripture and the teachings of Joseph Smith. Those teachings are how I justify my belief. As far as "God's eternal truths" - if it's important enough to be restored in every dispensation I'd call that eternal. Even the adversary recognizes the eternal, doing that which is done on every world. The plan of salvation is the same on every world, so are the ordinances. The name of the Church - probably not. D&C 127 27 ... and build a house to my name, for the Most High to dwell therein. 28 For there is not a place found on earth that he may come to and restore again that which was lost unto you, or which he hath taken away, even the fulness of the priesthood. 40 And verily I say unto you, let this house be built unto my name, that I may reveal mine ordinances therein unto my people. 42 And I will show unto my servant Joseph all things pertaining to this house, and the priesthood thereof, and the place whereon it shall be built." I could keep going, there are so many. This barely scratches the surface. My issue and concern isn't continuing revelation, it isn't command/revoke. It's that there appears to be nothing to believe in when anything can change. And I believe there is a gospel that is the always the same, unchanging, and utilized on all God's worlds without number. They are the laws required to become a Celestial being, the ones that made God into God. Even if we can't all agree or even understand them right now. Abraham didn't know that. Focus on the instant his hand was stayed, just before recognition occurred. Such moments are where our souls are made or broken. So does that represent God changing an element of the gospel? If not, I don't see that it falls under the thread topic. God told Abraham to do something different, just as he told the saints to go from Nauvoo to Utah. God didn't change any doctrine. He never except to reveal more or newer doctrines. He never contradicts himself. G-d said to Lehi, as He'd said to Abraham, "Lekh lekha!" But then He said, "Hold on. Send the boys back for the girls." And then He said, "Just keep waiting here for a bit longer. The boys need to go back a second time. For plates this time." G-d never changed His mind. The prophet only knew a part of G-d's mind. Then more was revealed. Same as Abraham on Moriah. Same as now. if it's﻿ im﻿portant enough to be restored in every dispensation I'd﻿ call that etern﻿a﻿﻿l. How do you determine something has been restored in every dispensation when records are so limited? Correct. It simply isn't knowable. So you don't believe that everyone on the earth needs to be baptized by authority (either in life or vicariously) to enter the Kingdom of Heaven? You don't believe that only those sealed for time and all eternity will be married in the hereafter? I believe Joseph when he teaches that the ordinances were established before the earth, revealed each time by Adam, and that all men must be judged on the same principles. JL, that's how I've always thought it was supposed to be. Not saying I believe it now. I wasn't challenging you, but asking for clarification. I thought you meant something different, that we could check in other scriptures ( specifically the Bible given the context, but also PoGP for believers) to see if there was a prophet discussing a certain principle in each dispensation to determine what were eternal principles. It becomes something different imo when one prophet says "I am teaching a principle that has been taught in each dispensation" but we have only record of his teaching. At that point, it is about having faith that prophet speaks the revealed truth and if one believes he speaks revelation from God, what does it matter whether it has been taught before (or whether or not there are records of this teaching) or revealed for the first time by God through him? PS: I don't believe God is inconsistent, I believe we just lack understanding of the whole picture...just as somethings in science seem paradoxical because we don't have a truly unified theory yet. Nature is not being inconsistent because water as a solid floats while most other compounds, the solid form is heavier than the liquid, for example. Or because sometimes light acts as a particle from what scientists can measure and sometimes as a wave, does this mean it actually switches its nature and is thus inherently inconsistent or is it that we only see some of the picture of what it is at this point, so our understanding is what is inconsistent? What about the forty day period or times when Christ told his apostles to speak to no one of his teachings?